Local DAR chapter learns a little more Mansfield history. 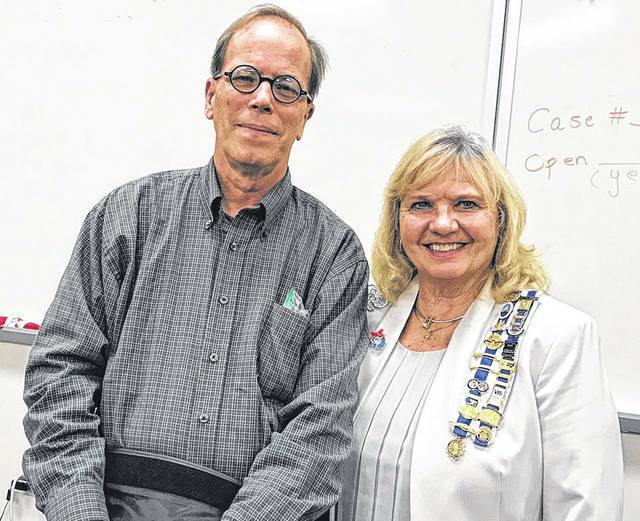 BELLVILLE — The Jared Mansfield Chapter, National Society of the Daughters of the American Revolution, had its October meeting last week at the Ohio Genealogical Society. Regent Joyce Vanatter led the Opening Ritual. Pat Jennings, Chaplain gave the opening prayer. Regent Joyce Vanatter led the Pledge of Allegiance to the Flag of the United States of America and The American Creed. The Regent welcomed members and guests. Regent Vanatter thanked the chapter members who had attended and donated refreshments to the 60th anniversary rededication of the Ohio DAR Forest on Route 97 in Mohican State Forest on Sept 23. Nancy Clark, OSDAR Conservation Chair, organized the event and OSDAR State Regent Nancy Schirm Wright presided. The DAR Day of Service is Oct. 11. To thank them for their service, members donated cookies to the Jefferson Township, Washington Township and Troy Township fire departments. Scott Schaut, director of the Mansfield Memorial Museum, r presented a program “Mansfield 100 Years Ago” in honor of our upcoming 100th anniversary. He presented over 100 pictures of Mansfield back in the early 1900s. North Lake Park had a figure-eight roller coaster, large pavilion for dances and concession stands. There were many beautiful homes, businesses, amusement parks, and viaducts that have since been razed. A large American Flag made with light bulbs that once was on the front of the ‘The News’ building is now above the front door of the Mansfield Museum. In 1919, Mansfield Police Department was comprised of 17 men. He had a rare photo of Mansfield stage actress Gertrude Berkeley, the mother of Busby Berkeley, an American film director and musical choreographer, she is buried in an unmarked grave at Mansfield Cemetery. Veteran Services Chair, Pat James-Hasser announced the last cookout for this season will be held at the VA Clinic on Fri. Oct 12. She asked for volunteers to help serve that day. The Hostess Committee was recognized and thanked. Announcements were made, and the meeting was adjourned. The next DAR Chapter meeting is Nov. 2 at 1:00 pm at OGS. the guest speaker will be Verona Drane, director of ‘Habitat For Humanity’. The DAR, founded in 1890 and headquartered in Washington, D.C., is a non-profit, non-political volunteer women’s service organization dedicated to promoting patriotism, preserving American history, and securing America’s future through better education for children. Any woman 18 years or older who can prove lineal descent from an ancestor who aided in achieving American independence is eligible to join. Contact the chapter Regent at 941-224-4888. Courtesy photo Scott Schaut, director of the Mansfield Memorial Museum, and Joyce Vanatter. Schaut was the best speaker at the recent meeting of the Jared Mansfield Chapter, National Society of the Daughters of the American Revolution. https://www.thebellvillestar.com/wp-content/uploads/sites/39/2018/10/web1_Another-DAR-photo.jpgCourtesy photo Scott Schaut, director of the Mansfield Memorial Museum, and Joyce Vanatter. Schaut was the best speaker at the recent meeting of the Jared Mansfield Chapter, National Society of the Daughters of the American Revolution.